Hello my fellow stampers, what a week! I'm glad it is over and a new week is starting. I'm happy to be creating again! I'm also excited because it kicks off my birthday week! 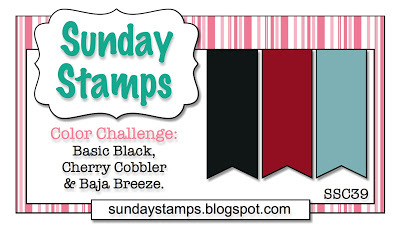 Holly is our host this week at Sunday Stamps and she has a great color challenge for us! I hope you will take time to create something and play with us. We love to see what you create. Deadline to link up your project is Friday, March 15 at 6 pm EST. When I saw Holly's color combo, so many different ideas ran through my head but in the end I created a simple card. I used the stamp set Feeling Sentimental from our current Sale-a-Bration. I won this stamp set at Spring Fling and am finally inking it up! Can you believe SAB will be over in two weeks! Eek! Last day to take advantage of all the cool stuff is March 22. You can't tell from the photo but I used stamping dimensionals to pop up the whisper white onto the basic black and then onto the baja breeze dsp. I really like how it came out. The inspiration for my card this week came from this card we made at Spring Fling a few weekends ago. Hope you have a wonderful Sunday! Thanks for stopping by! Until next time. I love, love, love the simple and clean design of this card. The pop of red is brilliant, and the polka dot DSP is so fresh. Fabulous card, Kathya!